The hazelnut is the hard-shelled fruit of the hazelnut tree. Hazelnuts, also known as filberts from European folklore, are believed to have originated over 5000 years ago in prehistoric China. Currently, the world’s top three producers of hazelnuts are Turkey, Italy, and the United States. Hazelnuts are very high in energy and loaded with numerous health benefiting nutrients that are essential for optimum health. Hazelnuts contain almost 80 percent monounsaturated fat and less than 4 percent saturated fat. Hazelnuts have one of the highest ORAC (Oxygen Radical Absorbance Capacity) scores of any nut; ORAC is the most widely accepted method of measuring antioxidants, the compounds that fight damaging free radicals in the body. Hazelnuts are the richest source of folate among tree nuts. Folate, also known as folic acid or vitamin B-12, is essential for many of our body’s metabolic processes. It aids the production of red blood cells, supports brain function and cardiovascular health. Hazelnuts are used in confectionery to make praline, and also used in combination with chocolate, for chocolate truffles and products such as Nutella and Frangelico liqueur. 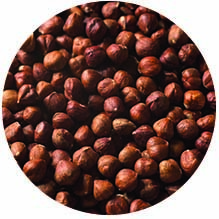 Hazelnut oil, pressed from hazelnuts, is strongly flavoured and used as a cooking oil.